If the above accessories are ordered as part of a complete kitchen they will be included in the kitchen delivery charge. 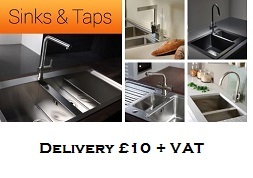 In all other instances there will be a standard delivery charge of £10.00 plus VAT to mainland UK. 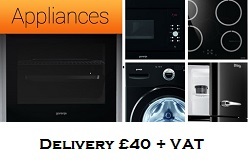 If the appliances are ordered as part of a complete kitchen they will be included in the kitchen delivery charge. 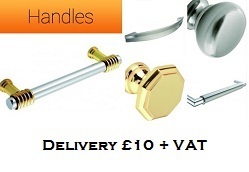 In all other instances there will be a standard delivery charge of £40.00 plus VAT to mainland UK. Our products are delivered between 9:00am and 5:30pm by courier to the address of your choice. It is vital that someone is available to sign for the goods as they cannot be left without an authorised signature. You will receive your goods as quickly as possible and at very reasonable cost. 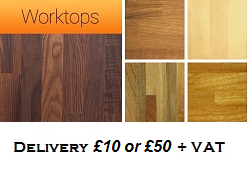 Our standard delivery time is 2-5 working days (dependent on stock availability). All received orders will be processed immediately (subject to availability) but no guarantee can be given of next day delivery. You will be notified immediately in the event of your chosen product being out of stock. We can place your chosen product on back-order for delivery in the future, or you may cancel your order at this point. Every effort will be made to deliver orders within the delivery option requested at the time the order was placed. However we cannot guarantee this and we will not accept responsibility if your order is delivered outside this time. We recommend you only arrange for experienced tradespeople to carry out the work on your behalf after your order has been delivered from us. IMPORTANT DELIVERY INFO: We use national carrier companies to deliver our worktops and are bound by their own delivery policies. Depending on the number of worktops ordered several people may be required to assist the driver with unloading. Please note that drivers are only required to deliver to the kerbside and help with unloading and are not responsible for carrying products on to customer premises. Our products are delivered between 9:00am and 5:30pm to the address of your choice. It is vital that someone is available to sign for the goods as they cannot be left without an authorised signature.